It doesn't require extraordinary motive or means to hack remotely accessible systems for their processing power. But due to many organizations poor security practices, there's plenty of opportunities. Throw a hostile user that doesn't need much motivation but has plenty of means and opportunity into the mix, and it's a pretty dangerous landscape of IT threats out there for any organization. Most organizations assume that the hackers who threaten them will be motivated by the value of the information the company uses to provide its services. The truth is that cyber criminals don't necessarily care about the value of corporate, personal and/or financial data. Many attacks are perpetrated on systems because there's value in the processing power of the systems themselves. As Windows infrastructures grow and evolve, it gets more and more difficult for security experts to see all the endpoints in their architecture. And you need to know your Remote Desktop vulnerabilities to mitigate your risk. 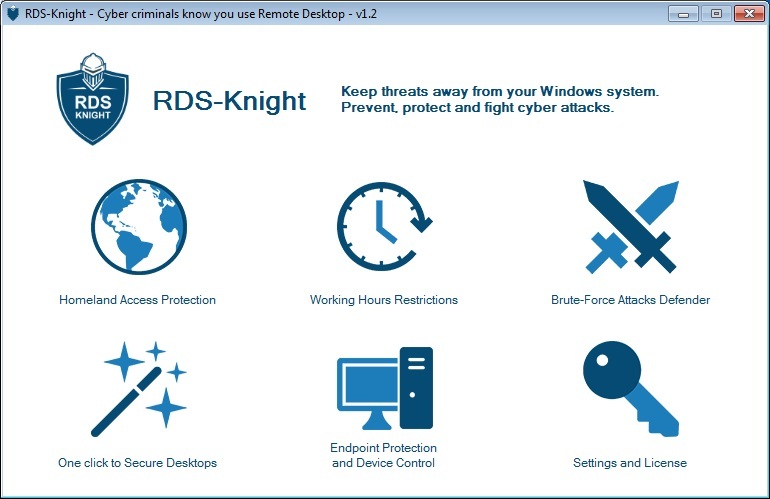 RDS-Knight approach combines advanced technology, the latest lessons and insights our elite team of Remote Desktop cyber security specialists bring back from real-world missions. Try it now! RDS-Knight will be your secret weapon. Easy-to-use, it will fullfill your expectations to protect your RDS servers against hackers. solution for the detection challenge, combining real-world experience and expert insights with smart, easy-to-use and efficient software, enabling rapid response to enforce security.